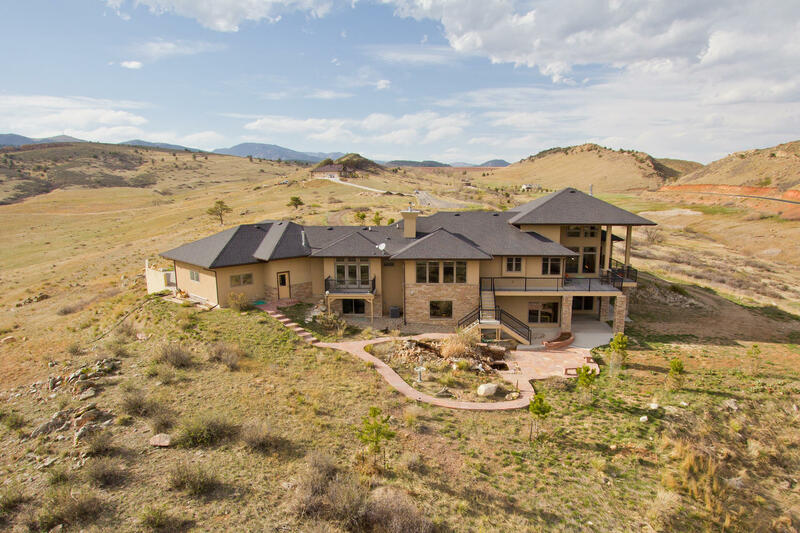 Colorado Serenity, this amazing property stands out like a beacon and boasts 360 degrees of Eye-popping mountain views! See to DIA or Pikes Peak on a clear day! Sprawling Walk-out, Prairie Style- Custom Ranch, Uniquely designed by David Hueter stunning architectural appeal and sited on 37 peaceful acres in the gated Sedona Hills Community. 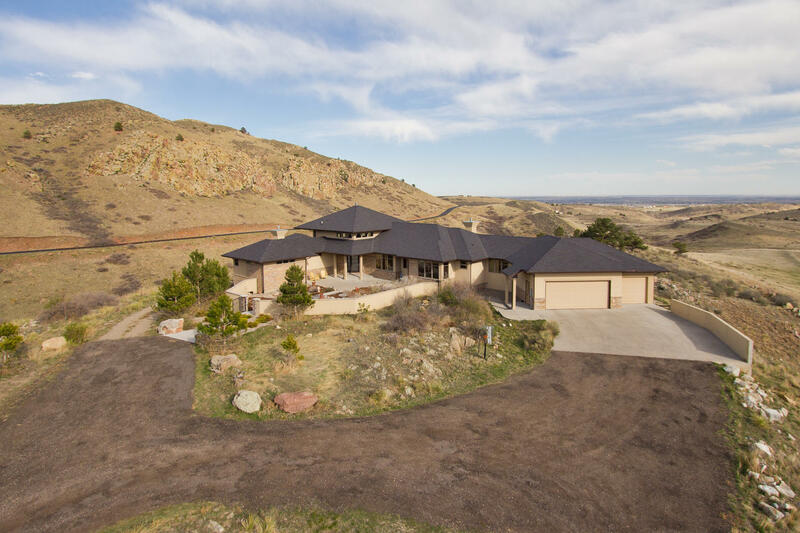 Five Spacious Bedrooms, Six Bathroom, Owner’s Suite Master Fireplace, Family Room Fireplace and wood burning fireplace in the Sunken Living room with nearly floor to ceiling windows to take in the breathtaking views! 6,625sqft. total and 6,130 finished sqft. with 3,322 finished on the main floor! Luxury finishes throughout, and the spacious lower level showcases a theater room, full kitchenette with stainless appliances, Sunken living room, gorgeous mahogany floors, alder casing and trim throughout, Over 3,000sqft.of beautifully designed outdoor living! Allows for Horses! Tranquil water feature on the south side that flanks the custom flagstone patio nearly 700sqft. Beautiful “Dry Creek” runs through this property. No water rights. Flagship lot in Sedona Hills, a One of Kind offering, and beautifully unique with all wood clad windows, natural Maple cabinetry, all Jenn-air stainless appliances (6 burner with griddle) downdraft range, prep sink, double wall ovens, very open concept kitchen – ideal for superior entertaining both small and larger scale. Beautiful slabs granites throughout, stone and tile work! Central Vac. The Owner’s suite, has its own entrance to the spacious 661 sqft. 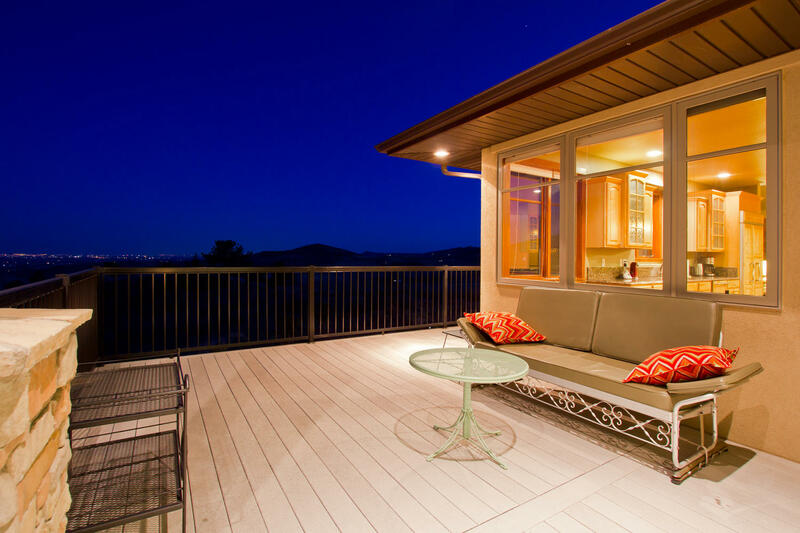 composite deck, 21’ X 17’ with a phenomenal luxury 5 piece bath, walk-in frameless shower, air- tub, equipped with its own convenient washer and dryer! Garage can fit 5 smaller cars - very spacious at 1,037sqft. heated and insulated with additional quick basement access. Walk to Carter Lake's south beach. Gorgeous flagstone patio and water feature, and perennial courtyard! Two High Efficiency Furnaces, central A/C, programmable tankless hot water heater, and backup heat pumps, exterior full irrigation and drip system. 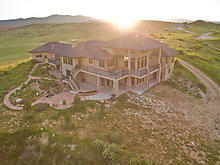 Easy Quick Access only 7-10 minutes west of Hwy 287 and 15 minutes to Loveland and Longmont! Seller is including: 7,000lb. lift in the garage, Riding Craftsman mower only 3 years old, Olhausen Pool Table, and 1928 Schaeffer Piano as well as all theater room A/V equipment and projection.